Before we begin these tales, we must make clear that non-Muslims are not allowed into Mecca. I'm about 7 and my brother about 5. My dad has become interested in scuba diving and he decides that he wants to drive from Ras Tanura, on the Arabian Gulf coast, across the country to Jeddah, on the Red Sea coast, to go diving. This is about a 900 mile trip and, back then, took about 16 hours of driving. It has become a favorite family tale that we non-Muslims drove through Mecca. My dad drove through the night, mostly because I was car sick, to reach our destination as soon as possible. When you get to Mecca, there is a bypass route so that non-Muslims can go around the city they are not supposed to enter. It was late at night, so my brother and I were asleep. Dad apparently missed the turnoff and so when he reached the security checkpoint...well, they waved him through! We're not really sure if it was because it was so late they didn't see, it was too convenient to make him turn around, or what. The point is, we always tell how we drove through Mecca. I, being asleep, really missed the whole thing. It's a good 45+ years later and a lot has changed and yet I have a new Mecca story to tell. One I wasn't slow to call and report to my dad. This time I am with my Saudi roommate, Azhar, who is from Mecca, and Jeff, an American friend. We decided to go to Taif for the weekend and so we must drive right by Mecca. Jeff and I are well aware of the rule that we are not allowed in Mecca. There are signs about the need to separate and re-route away, but they are very unclear. Unfortunately, I missed getting shots of the really important ones: "Entering Haram Border", etc. 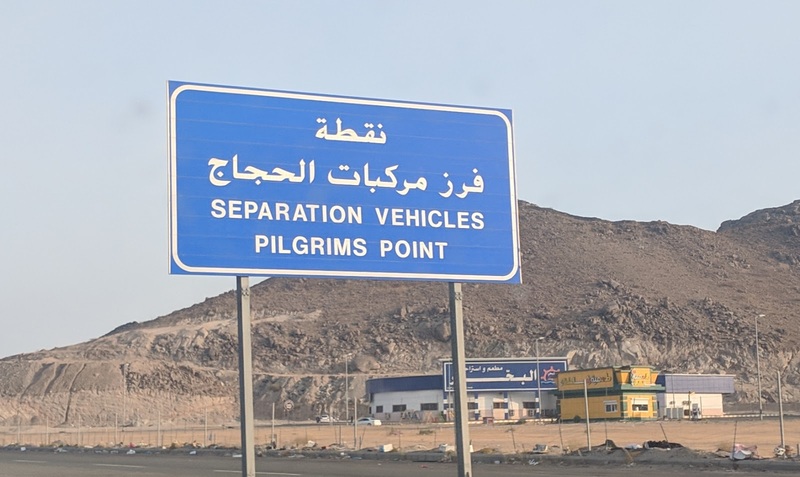 Turns out that you can go to Mecca, you just can't go passed the Haram Border. Haram means "holy" and so you aren't supposed to pass into the holy zone. To be quite honest, we are unsure if we might have, just on the very edge, entered the holy zone or not. 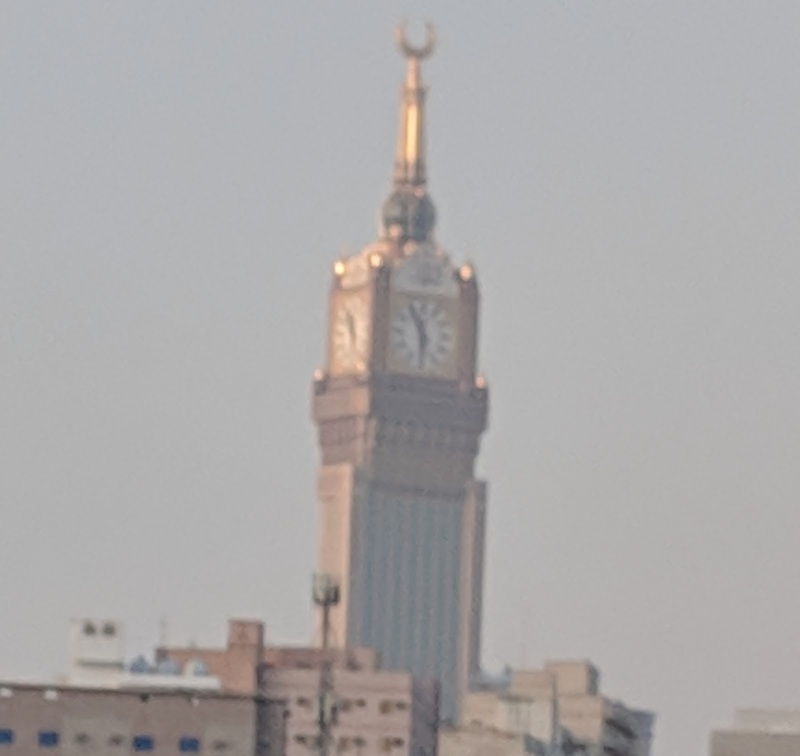 I would say that we were within a mile of the Great Mosque just based on our sighting of the Royal Clock Tower in the distance. 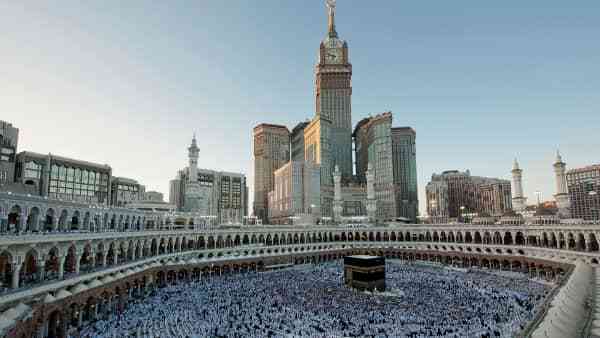 Mecca is now such a large metropolis that the holy zone is well within the city boundaries now. A lot of growth in 45+ years.